In a hurry? Pin it here! DIY raised garden beds are perfect for grow fruits, vegetables, and herbs. However, vegetable gardening can sound like an overwhelming task if you don't know the basics. You might wonder if you can actually build a raised garden bed of your own or where you could place it on your property? What materials should you use to construct your vegetable garden? Which fruits and vegetables should you grow? However, this is one DIY garden project you can complete! Armed with just a little background knowledge and your "green thumb," you can create a food-producing garden worthy of your dinner plate. That's what we hope to help you accomplish. On Episode 19, we will walk you through our personal home vegetable garden building project and give you some tips and tricks on how to build your own DIY raised garden beds, where to place them once they're built, which soil to use, how to plant your crops, and some basic maintenance advice. Also, you can reference our blog post regarding building your own raised garden beds for specs and graphical diagrams. 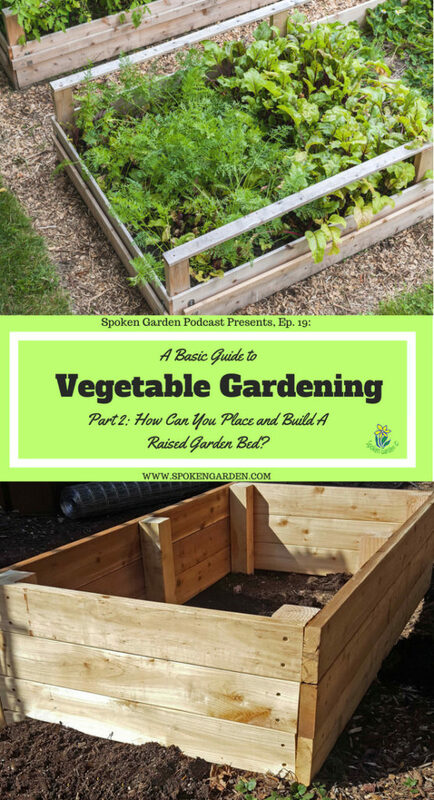 This episode is for those of you who need help creating your very own vegetable garden, including how to build raised beds, where to place them, and which fruits and vegetables you wish to grow. This is part two of our two-part podcast series on vegetable gardening basics. Listen to part 1 here. And hey—before you head out—if you want to connect with us and subscribe to our newsletter go to Spoken Garden's free resource page! We have FREE content we are so excited to give to you! See you there! After listening to this episode, what kind of raised bed do you plan to build or have you already built? What do you intend to plant in your new beds? Email us at SeanandAllison@spokengarden.com and let us know! We’d love to hear about your progress! Vegetable Gardening + Raised Garden Beds! Learn how to build your own DIY raised garden beds as well as where to place them once they're built. Where raised garden beds should be placed on your property. Materials you could use to create raised garden beds. Suggestions for fruits and vegetables you could grow. Do's and don'ts when planting flowers in containers. Some of the resources below may be affiliate links, meaning we might get paid a commission (at no extra cost to you) if you use that link to make a purchase.? Ep 18: Vegetable Gardening Part 1- What It Is and Why Do It. 3 Simple Things Gardeners Should Consider Before Planting a Vegetable Garden: Garden Basics Part 1. 9 Fruits and Vegetables to Plant Right Now For a Summer Harvest! Power Drill - What we used! . Regular Hammer - What we used! Carpenter Pencil - What we used! Carpenter's Square - What we used!